It is officially that time of year again: that time of year when I design, render, and build six Ren Fest costumes and keep my costuming skills alive! This year, in case you couldn’t tell, we went as the Merry Folk of Fulshear. The story behind this is as follows: right after last year’s Ren Fest, I asked my little nephew, “what do you want to be next year, Liam?” to which he responded, “an archer!” to which I responded, “an elf archer?” to which he responded, “no, just an archer,” to which I responded, “how about a faerie archer?” to which he again responded, “no, just a normal archer. Just an archer, Aunt Elisa.” Well, when I asked him again in August, when I had a week between summer and fall classes to work on costumes, he said exactly the same thing as last fall. I was amazed he actually remembered! At that point, Kristie (my big sister, and Liam’s mom) proposed we pick that up as a theme and go as the Merry Folk of Fulshear. Kristie is delightfully clever with wording, and I quite fancied the idea, so we went with that. 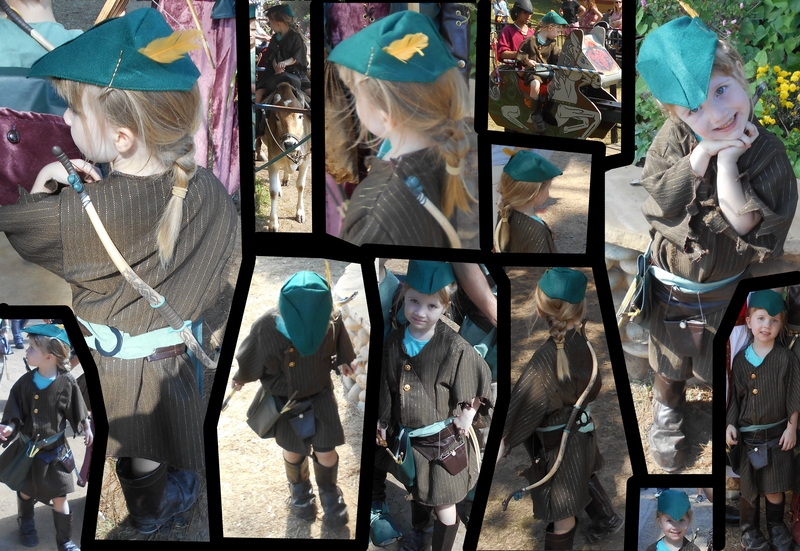 While I was doing my initial sketch renderings, it became very apparent that the costumes I was planning did not fit into the medieval-England technology box (the kids had specifically asked for shiny buttons and no laces, this year), so in the end, we were a sort of Dungeons and Dragons/Robin Hood group of three archers, one crossbow-wielding scout, a quarterstaff wielding quartermaster (Little Joan? ), and “Cleric Tuck.” My friend Travis (you’ve seen pictures of him from previous years, if you’ve seen my previous costume posts) was slated to be Cleric Tuck, but he couldn’t make it to the fair on the same day as the rest of us, so I don’t have pictures of that costume to include in this post. I may show you pictures of that costume at a later date, but today, I’ll give you the rundown of those of us who were there. 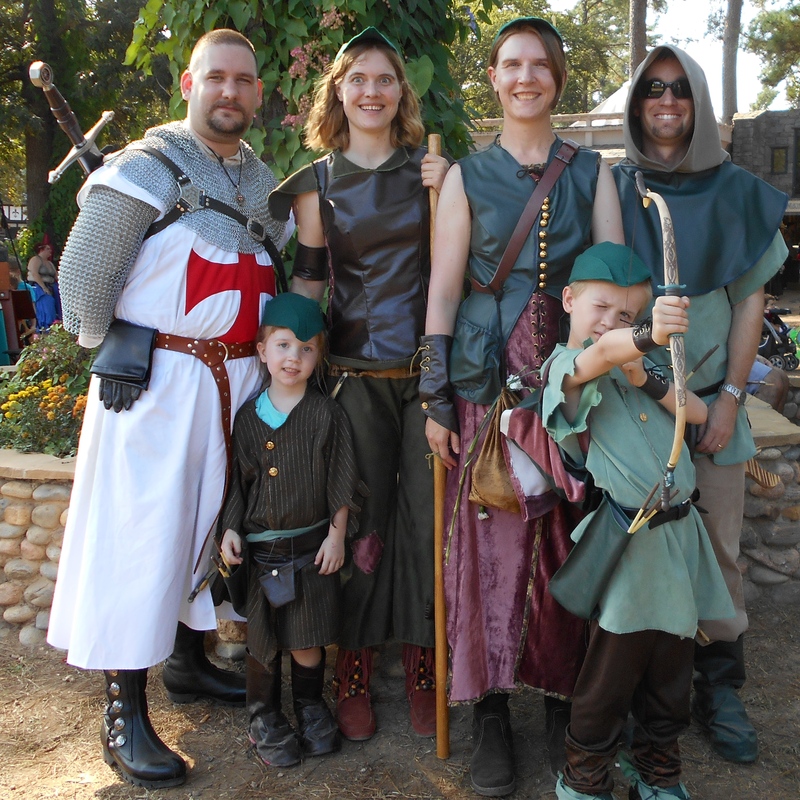 First of all, if you look on the far left of the above picture, you will see my brother-in-law’s cousin Jonathan, who went as a Knight Templar. I did not build his costume, but Kristie and I decided he was our King Richard the Lion Hearted. He did not like the idea at all, but the idea stands in my imagination. The quarter-staff is actually one of my weapons from my Tae-Kwon-Do days, and you may recognize the dagger from last year’s costume, though I re-embellished it for this costume. The boots are from a sketchers outlet, but I embellished them myself. Everything else in that costume was hand-made by me. 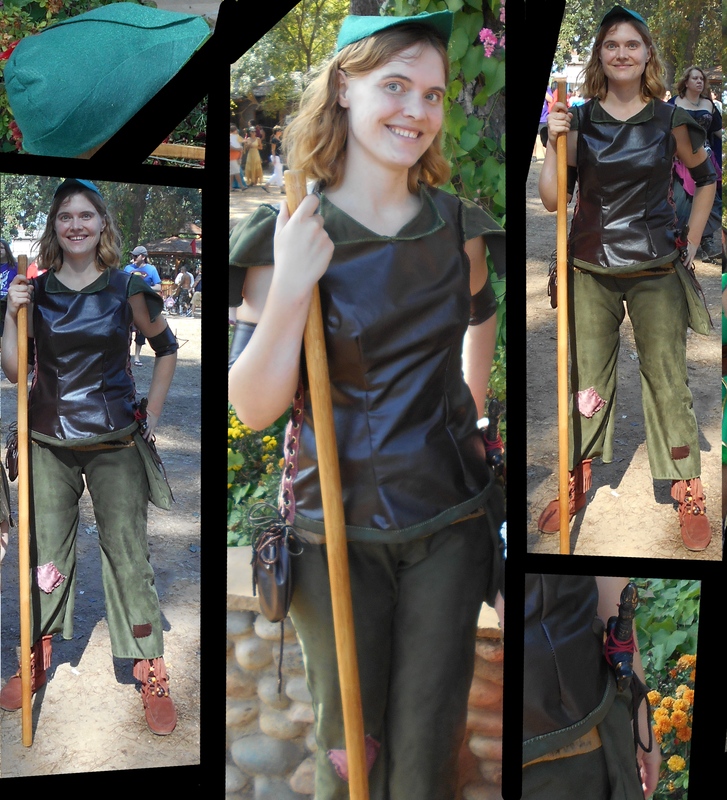 Yes, I actually made myself pants this year from the same faux-suede with which I lined the bodice. I would like to point out the gigantic pocket-bag I had hanging off of my belt this year. That was among the best ideas I’ve ever had! It was super-handy, and I couldn’t possibly lose the thing as we wandered the fair. Finally, did you notice the hat detail? 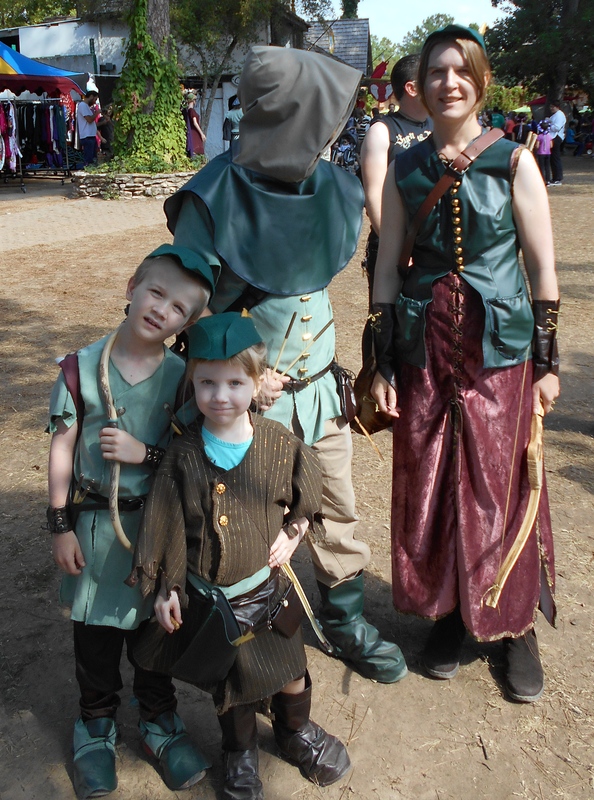 I made 4 Robin Hood style hats out of wool/polyester blend felt for our costumes this year, and that was a bit of a process! Like most of the things I design, I made up the pattern as I went along, and I’m pleased with how well those hats turned out in the end. You may want to click into that image for the full-sized version. Anyhow, I love the pockets on Kristie’s vest this year, though they were surprisingly hard to make. 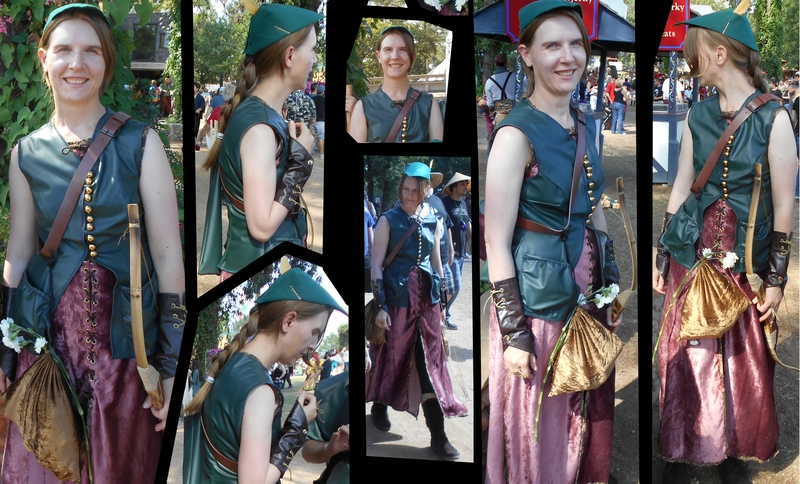 You may recognize the pouch, riding tunic, and archer gloves from Kritter’s previous Ren Fest costumes, but they were just as hand-made-by-me as the new elements (granted, last year and the year before respectively). I thought her idea to affix the pouch to the strap of her quiver was genius! Also, she is significantly more photogenic than I am! 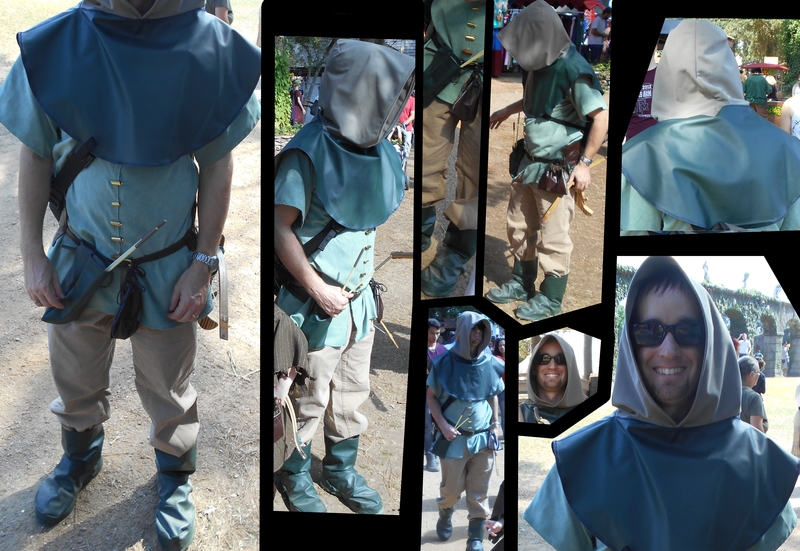 Next is Ryan, who made my costume-making-year by agreeing to let me build him a costume and join in on the family fun! 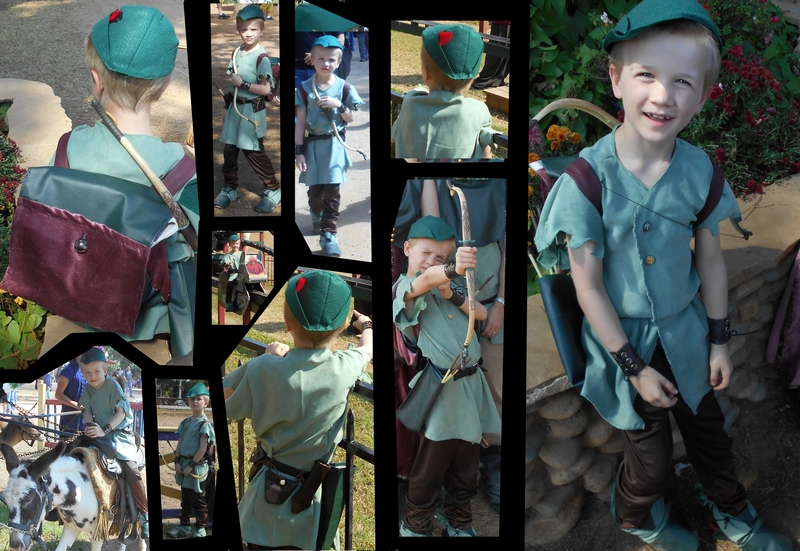 Bearing in mind that the sunglasses and the wristwatch are not part of the costume, Ryan is sporting the “forward scout and crossbow wielder” costume I designed and built for him this year! WOOHOO! 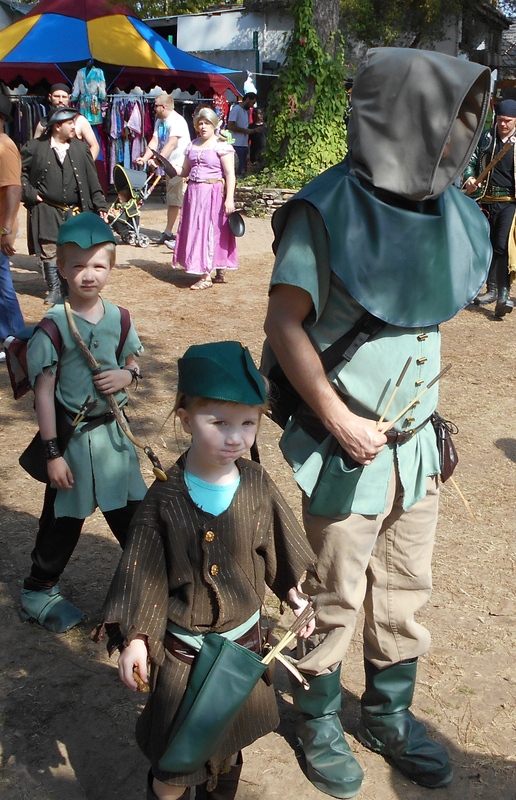 Did you notice that he’s the only person in our Robin Hood group who is actually wearing a hood? Originally, the quiver was designed to buckle to his thigh, but he found that uncomfortable, so we moved it to his waist-belt. The waist belt is actually from Kristie’s 2012 ranger costume, but everything else is new to this year’s set, including the boot-caps. This was actually my first year making adult-sized boot caps, and I think they turned out quite well. I’ve got to say, she wears it well, and she was just as super-cute as Liam. She is actually wearing the boot caps I made for Liam two years ago, because they fit her now! Funny how kids grow like that. She was getting pretty good at using that toy bow by the end of the day, thanks to the help of her cousin Jonathan, the Knight Templar. Looks like a grand time!! !